'Sydney Heads', the only known Sydney subject by the artist, is a product of von Guérard's first and only excursion into New South Wales in November 1859, when he visited Sydney, the Blue Mountains and the Illawarra region. The painting was worked up in his studio in Melbourne six years later, most likely on the basis of a preparatory drawing now in the State Library of New South Wales, Sydney. Von Guérard's atmospheric rendering of this light-filled scene, together with his sensitive and precise depiction of topographical detail and human activity within a tightly controlled composition, makes 'Sydney Heads' one of his finest paintings. Von Guérard reverted to the composition of the drawing in his 1865 painting of the view - flattening the foreground slope and decreasing the North/South breadth of the Harbour and scale of the hills beyond Manly to increase a sense of space and grandeur. Addition of a tree to the left of Vaucluse Bay provided a picturesque framing device, whilst he also transformed the rough heathland of his 1860 painting to elegantly grassed slopes - perhaps to appeal to a contemporary preference for countryside of a more tamed, European appearance. Details such as the group of figures around a fire at right, added foreground interest - improving the overall balance of the composition. He bathed the scene with the rose-tinted light of late afternoon, clearly intending an altogether more luminous and poetic impression than in his painting of 1860. Von Guérard's painting, 'Sydney Heads' 1865, with its combination of elevated sentiment and remote and wild, yet partly civilised subject, relates to both homestead portraits and wilderness views in his oeuvre. As such the work takes its place within a wider international context of European artistic engagement with newly colonised lands, finding particular parallels for example with the contemporaneous work of the 'Hudson River School' artists in America. As Joan Kerr, Australian colonial art historian, comments in the catalogue to The Artist and the patron exhibition (1988), picturing the harbour 'was an almost obligatory subject for amateur and professional alike…This was not only "the most beautiful harbour in the world" it was the first sight of the new land for many arrivals and the first step towards regaining the ancestral home for many departures'. In Eugene von Guérard's 'Australian Landscapes', containing twenty four colour lithographs of landscape views (published by Hamal and Ferguson, c.1867 - 68), plate XXII 'Sydney Heads, New South Wales' is described thus; 'From the summit of a knoll on the roadside from Sydney to the narrow promontory known as the South Head, is visible the lovely prospect depicted by our artist ... The road to the South Head is deservedly a favourite drive with the inhabitants of Sydney, and the stranger passing over it for the first time experiences a succession of demands upon his admiration, as each bend in the road discloses to him some new combination of sea and shore and sky, each lovelier than the last'. The various extant versions of the painting and the lithograph which was the last work to be completed of the subject by von Guérard, offer a number of interpretations of the pencil drawing. 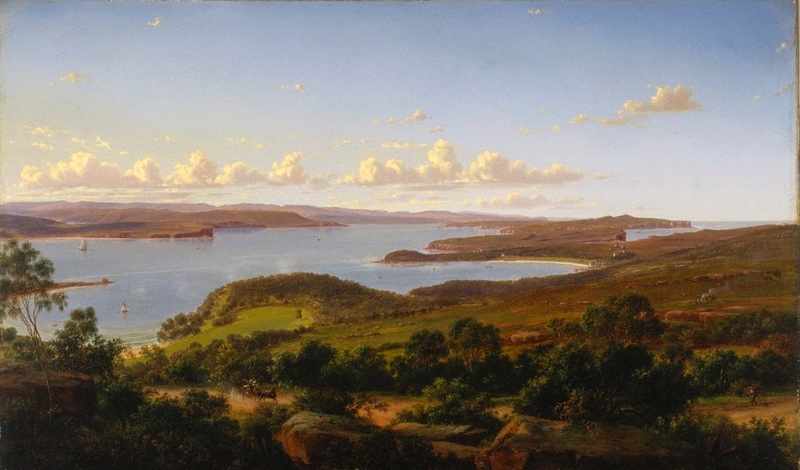 Focusing on what has been described as one of several classic views encompassing Sydney Harbour's quintessential qualities, and painted by innumerable artists, von Guérard's 'Sydney Heads' depicts a broad sweep of landscape from Vaucluse Bay on the left to Watson's Bay and Sydney Heads at the right, with the road to the South Head in the foreground. Despite partial screening by vegetation and buildings, the accuracy of his transcription of the view may be confirmed today from the vicinity of 'Johnston's Lookout' in Vaucluse, the probable viewpoint for the artist's preparatory drawing. However, whilst clearly concerned with accurately and informatively depicting a view already well known for its 'picturesque' synthesis of grandeur and beauty, von Guérard also aimed to transcend mere topography. Von Guérard scholar Candice Bruce suggests that during the artist's training at the Kunstakademie in Dusseldorf (c.1839 - c.1846) he probably saw the work of the principal German Romantic painter Caspar David Friedrich, whose style and mood his work later evoked, and became familiar with treatises by the main exponents of German Romanticism, Carl Gustav Carus (1789-1869) and 'Novalis' [dates]. The influence of von Guérard's earlier teacher in Rome, Giovannibattista Bassi - who taught in the traditions of Salvator Rosa, Poussin and Claude - also encouraged an interest in concepts of 'the sublime' and 'the picturesque' in art. In the newly established landscape class at the Academy, von Guérard was encouraged to go on long sketching trips in pursuit of the new naturalism or 'Naturegetreue wiedergabe' (a response true to nature). For the German Romantic landscape painter, each painting was an 'Erdlebensbildnis' or painting of the life of the earth, in which a focus on the microcosmic details of nature led to an awareness of the macrocosmic presence of the soul of the world. No detail was inessential. Hence von Guérard's attention to detail, visible particularly in the painting of the foreground trees and shrubs, which was typical of his practice, and demonstrated the specific influence of the German 'Nazarene' painters with whom he had also enjoyed some contact in Rome. A key belief of the German Romantic painters was that painting should be an expression of personal insight into the divine qualities perceived in nature. In 'Sydney Heads', von Guérard celebrated with semi-religious reverence, the sublime beauty of the scene. Selecting an elevated viewpoint affording a panorama of the harbour and its surrounds, the artist aimed to inspire a sense of awe and wonder in the viewer by accentuating the vastness of the sky and by implication, suggesting the great expanses of the world beyond. Signed and dated l.r. corner on rock, red oil "Eug:v:Guérard/ Melb: 1865".